← Is Capcom Breaking Up With Mega Man? Posted on July 28, 2011	by Derek "Gamer Crash"
Making the Case makes it’s grand return to Gamer Crash, putting the spotlight on some underrated or underachieving games. Up this week is an overlooked gem from Vigil Games, Darksiders. Darksiders is the first release from the guys over at Vigil Games. You get to step into the massive boots of War, one of the horseman of the apocalypse, and lay down some justice to those responsible for starting armageddon. It seems as though someone set off the apocalypse and called War down. Only thing is, the all but one of the seals was broken so technically speaking, the horsemen should never have been called on to the scene. Since you have arrived and all hell is breaking loose on Earth, you are being blamed for everything that’s taking place. Now being viewed as untrustworthy by your bosses over in the Elder Council, they’ve assigned a specter named The Watcher to keep you on a leash as you set out to figure out just what happened and bring the true conspirators to justice. The best way I can describe this one is if God of War and the Legend of Zelda had a love child together. 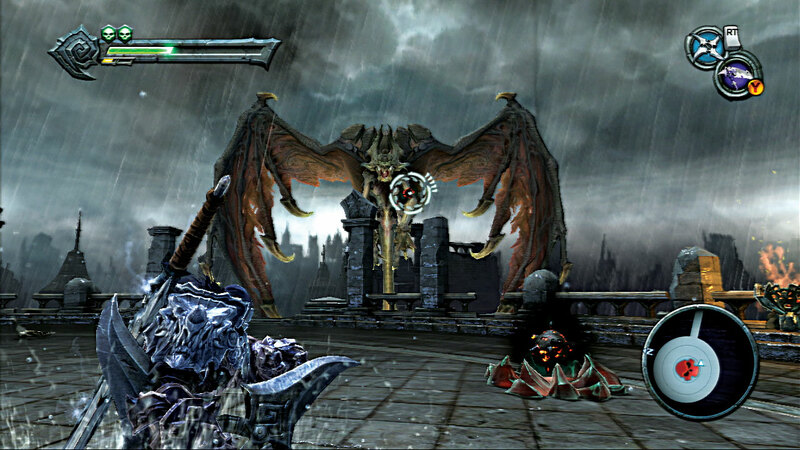 Darksiders does a fantastic job of marrying the brutal combos and combat of the God of War series, with the dungeon crawling and item gathering of The Legend of Zelda into one complete package. The thing is, the two elements are well done, but can’t compare to the real thing. So, what we have is a well made game, but not one that can break out of the mold. You’ll also find elements of Panzer Dragoon and Portal here as well. Yes, you heard me correctly, Darksiders has it’s own version of the Portal gun. The art direction is top-notch as the world and characters were designed by famed comic artist Joe Madureira. It’s certainly a colorful game, and you can certainly see a different look throughout the various zones you go into. You’ll see typical desert zones, the graveyard zone, a water filled dungeon, and so on. The dungeons themselves are certainly interesting and keep your attention though out. With that said, the world itself is fairly dead. I really would have enjoyed NPC characters you could interact with or talk to along your journey. Maybe get some background on what the place used to be or what happened in this section. Just another way to flesh out the story a little bit. As it is now, you’re really only able to speak to Vulgrim, who’s really only good for purchasing things, and Ulthaine who doesn’t say much outside of the quest you’re on with him. It feels like a missed opportunity that I’m hoping will be fixed in the upcoming sequel. Similar to Zelda, dungeons are introduced and each one has a specific tool or item you acquire within it. You’ll need to use the weapon to get through and also to beat the boss at the end. The bosses were interesting as each one mixed up the hack and slash formula each time making each one unique. You’re not likely to beat a boss the same way through your time in the game and for that I was thankful. The only thing is, once you understand how you need to beat the boss, it ultimately isn’t that challenging as you’d expect when fighting a boss type character in a game. Even the final boss at the end of the game isn’t really that difficult. One thing I would have liked to see as well is some sort of life meter. There’s no real way to see how far you are progressing against a boss unless they suddenly mix up their attack pattern. Basically, you just keep doing what you’re doing until a button prompt appears over the character which tells you the fight is over. Many of the items and tools you’ll come across are what you can expect to find in other action/adventure games. You’ll get things like the Crossblade (boomerang), the Abyssal chain (grappling hook), Mercy (projectile weapon) and many other things each with their own Darksiders spin and ability. 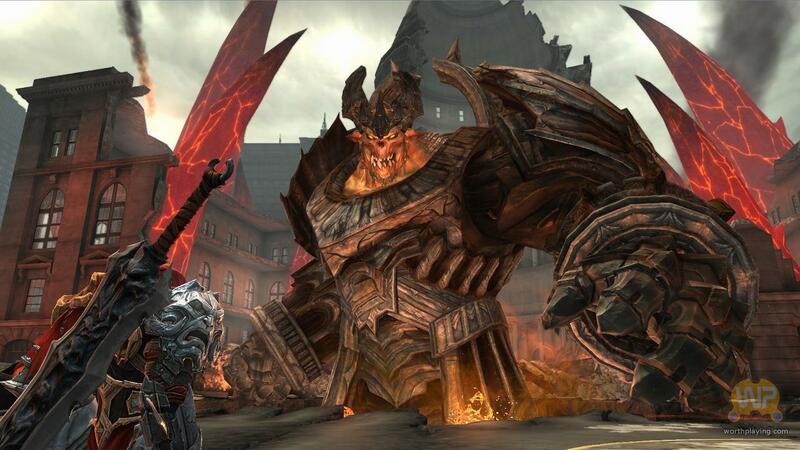 I’m not trying to claim Darksiders is a copy cat or anything, as everything presented is extremely solid and fun. Variety is something Darksiders has in spades and it helps keep things interesting and fresh. To my surprise, Vigil also threw in a portal gun called the Voidwalker, complete with blue and orange portals. You’ll really only use this item in one specific dungeon called The Black Throne. While we’re on the subject, The Black Throne was one of the worst dungeons I’ve had to do. It ranks up there with the Water Temple from Ocarina of Time. It’s just way too long and extremely tedious. You’ll have to fight the same boss 3 different times throughout and the puzzles can be pretty obscure sometimes. Playing through it, you can’t wait for it to be over. Thankfully, this is the only dungeon in the game that really gave me nightmares. The other ones are well paced and generally fun to run through. They’re not short either and will keep you invested for a good amount of time. 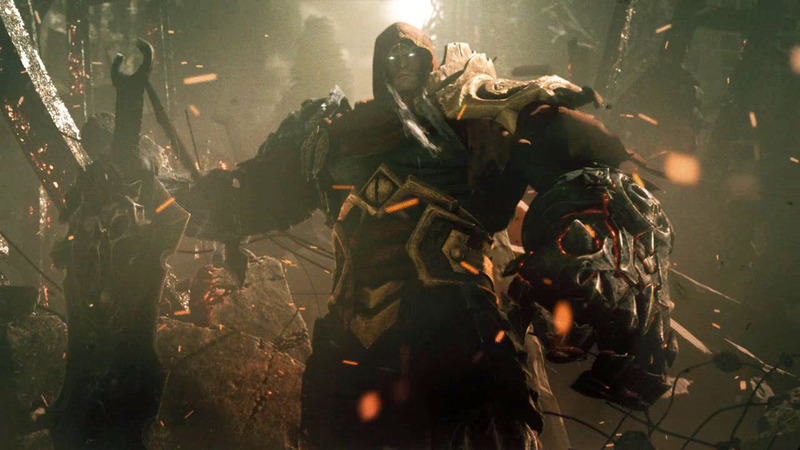 Darksiders encourages backtracking as it features plenty of hidden items to find. Grabbing four life or wrath shards will increase your meter, you’ll be able to find abilities (perks) which can be applied to weapons to give a bonus stat to War, and you can try to track down War’s legendary armor pieces which when fully assembled, gives him a major upgrade to armor and other stats. Customization is fairly limited with only the number of items you collect as there are no inventory items like armor drops or other RPG style elements. I hear that they’re adding these features in with the upcoming Darksiders II and I do think it’ll be a nice fit for the series. By defeating enemies or breaking structures around the map, War is able to reap souls and use them to purchase new items like combos, weapons, or items from the demon Vulgrim. I really enjoyed buying new combos, abilities, spells, and other things. Never got tired of doing that especially because it makes you feel even more powerful. The voice acting is pretty good. Unfortunately, the lead character, War, has no personality. It’s cool to see other character acknowledge his status as a horseman even if they don’t like him, but War comes off as very flat. He speaks with no emotion and doesn’t really say too much throughout the course of the game. The real standout here is Mark Hamill as The Watcher. Set to keep War on a leash for The Council, The Watcher provides a little humor and is a very nice contrast to the overly dry War. He does come off a little bit sounding like The Joker but honestly, I don’t care. His Joker voice is awesome. Controls are fine and work great for an action game. You have heavy strikes, quick strikes, and everything in between but some of the button placements is kind of odd. For example, Vigil placed the ability to dash and block on the same button. When you’re in the middle of a hectic fight or a boss battle, the last thing you want to happen is mistakenly dash when you want to block. This unfortunately made things harder than they should have been at times as it tended to be a bit sensitive. Each weapon has multiple combos that you can purchase for ultra devastating strikes. The animations are spot on and look great as well especially the Flipsaw move which has War quickly spinning downward with his sword sticking out like a saw blade. War will also gain access to his horse, Ruin at a certain point in the adventure. I would have liked to have used the horse more, but he’s only really able to be used in specific areas. Unfortunate. Darksiders also uses quick time events/button presses for parts in the game but not what you’d expect from something like God of War. You’ll only have to hit one button and watch War go to town. Typically, you’ll see this when an enemy is on the verge of death and pressing a button will show of a cool stylized kill animation. I’m guilty as charged on this one as many people were in completely writing it off. I completely skipped over this one back when it came out in January 2010. No reason really, just kind of slipped under the radar. Ultimately, I’m happy that I got around to it, even if it was well over a year late. The game has a ton of great things going on, even if many of the ideas are not truly original. It’ll run you around 15ish hours depending on how much you run around looking for every item in the game. With prices on this one low now a days, I’d recommend giving it a shot. This entry was posted in Making The Case and tagged games, Opinion, PS3, Xbox. Bookmark the permalink. Couldn’t agree more. The art design in this game is top notch. After reading through the Game Informer article, Darksiders II is sounding better and better. Can’t wait to see more on it.